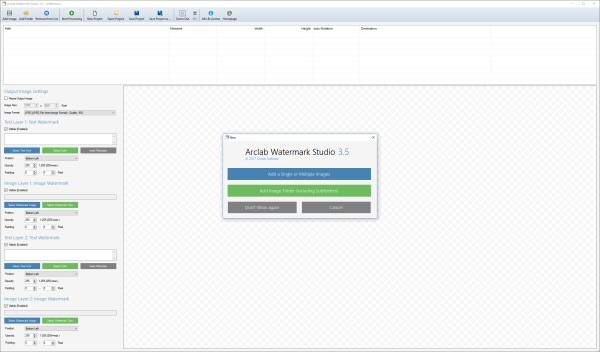 Add a single or multiple images using the "Add Image" function. Use the custom "Add Folder" function to add images and folder structures. The "Add Folder" feature let's you add multiple photos and whole folders at once. Simply check the images and folders to which the watermark (or logo) should be applied. It's possible to add complete folder structures including subfolders (recursive inclusion) to the batch processing queue. In difference to "Add Image" function, the watermarked output images will be created using the same (relative) folder structure as used by the source files. 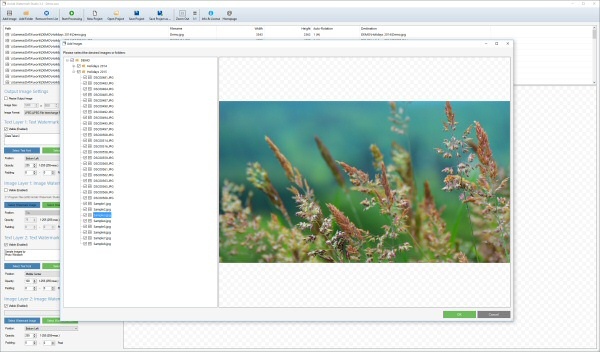 Watermark Studio allows you to add 2 image watermark layers (e.g. company logo) and 2 text watermark layers to your source images. The layers will be applied to all source images (photos) automatically ... just click on "Start Processing" and select the output folder. The program can process a high amount of pictures in a batch and supports all common image formats including interlaced JPG and PNG images.